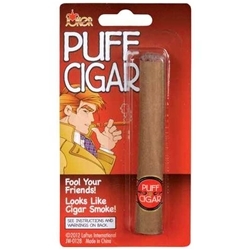 Classic Puff Cigars. Blow into cigar to give appearance of smoking. Available in 4" individually carded version or 4.5" loose pack. Also available now a 3 pack that gives you a discount for buying three!